In this article, we’ll discuss EnumSet class from the java.util package. EnumSet is a specialized Set implementation for use with enum types. All of the elements in an enum set must come from a single enum type that is specified, explicitly or implicitly, when the set is created. Enum sets are represented internally as bit vectors. This representation is extremely compact and efficient. Space and time performance of this class should be good enough to allow its use as a high-quality, typesafe alternative to traditional int-based "bit flags." Even bulk operations (such as containsAll and retainAll) should run very quickly if their argument is also an enum set. 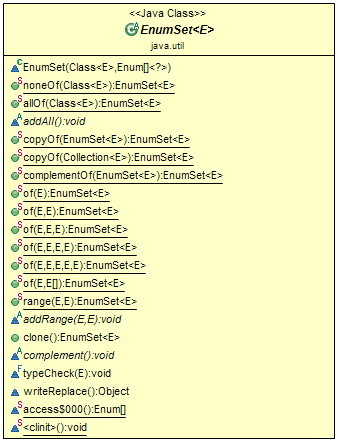 Like most collection implementations, EnumSet is not synchronized. If multiple threads access an enum set concurrently, and at least one of the threads modifies the set, it should be synchronized externally. static <E extends Enum> EnumSet allOf(Class elementType) - Creates an enum set containing all of the elements in the specified element type. EnumSet clone() - Returns a copy of this set. 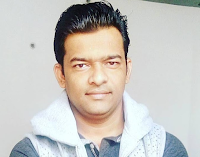 static <E extends Enum> EnumSet complementOf(EnumSet s) - Creates an enum set with the same element type as the specified enum set, initially containing all the elements of this type that are not contained in the specified set. static <E extends Enum> EnumSet copyOf(Collection c) - Creates an enum set initialized from the specified collection. static <E extends Enum> EnumSet copyOf(EnumSet s) - Creates an enum set with the same element type as the specified enum set, initially containing the same elements (if any). static <E extends Enum> EnumSet noneOf(Class elementType) - Creates an empty enum set with the specified element type. static <E extends Enum> EnumSet of(E e) - Creates an enum set initially containing the specified element. static <E extends Enum> EnumSet of(E first, E... rest) - Creates an enum set initially containing the specified elements. static <E extends Enum> EnumSet of(E e1, E e2) - Creates an enum set initially containing the specified elements. static <E extends Enum> EnumSet of(E e1, E e2, E e3) - Creates an enum set initially containing the specified elements. static <E extends Enum> EnumSet of(E e1, E e2, E e3, E e4) - Creates an enum set initially containing the specified elements. static <E extends Enum> EnumSet of(E e1, E e2, E e3, E e4, E e5) - Creates an enum set initially containing the specified elements. static <E extends Enum> EnumSet range(E from, E to) - Creates an enum set initially containing all of the elements in the range defined by the two specified endpoints. Let's take an example from Effective Java Book. In this example, we have used basic colors RED, GREEN, and BLUE to create a custom color by using EnumSet. As I said, EnumSet is very good for combining effects, whether it's text styles e.g. BOLD and UNDERLINE, as described in Effective Java, or combining basic colors to create custom color here. If you have MS paint, you can even test the combination of colors e.g. you can combine RED and BLUE to create YELLOW, combine all three to create WHITE, or combining RED and BLUE to create PINK.